Brethren, be strong in the Lord and in the strength of his might. Put on the whole armor of God, that you may be able to stand against the wiles of the devil. For we are not contending against flesh and blood, but against the principalities, against the powers, against the world rulers of this present darkness, against the spiritual hosts of wickedness in the heavenly places. Therefore take the whole armor of God, that you may be able to withstand in the evil day, and having done all, to stand. Stand, therefore, having girded your loins with truth, and having put on the breastplate of righteousness, and having shod your feet with the equipment of the gospel of peace; besides all these, taking the shield of faith, with which you can quench all the flaming darts of the evil one. And take the helmet of salvation, and the sword of the Spirit, which is the word of God. At that time, Jesus was teaching in one of the synagogues on the sabbath. And there was a woman who had a spirit of infirmity for eighteen years; she was bent over and could not fully straighten herself. 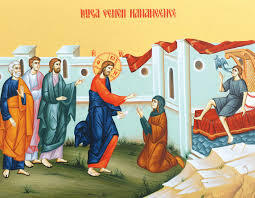 And when Jesus saw her, he called her and said to her, “Woman, you are freed from your infirmity.” And he laid his hands upon her, and immediately she was made straight, and she praised God. But the ruler of the synagogue, indignant because Jesus had healed on the sabbath, said to the people, “There are six days on which work ought to be done; come on those days and be healed, and not on the sabbath day.” Then the Lord answered him, “You hypocrites! 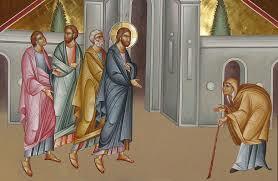 Does not each of you on the sabbath untie his ox or his donkey from the manger, and lead it away to water it? And ought not this woman, a daughter of Abraham whom Satan bound for eighteen years, be loosed from this bond on the sabbath day?” As he said this, all his adversaries were put to shame; and all the people rejoiced at all the glorious things that were done by him.